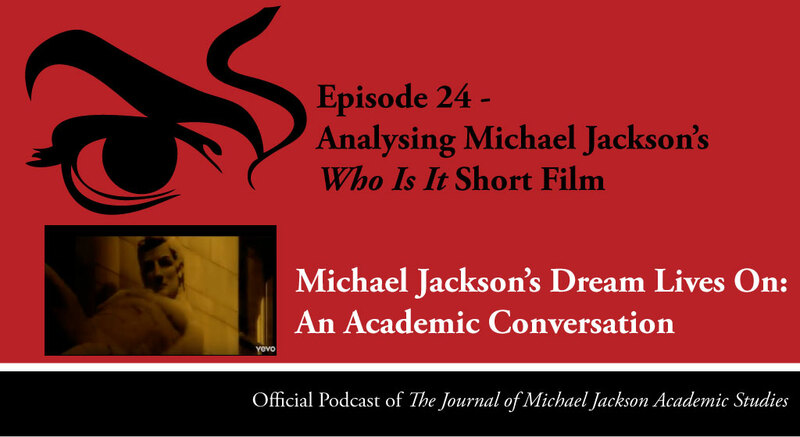 Abstract: In this brand new episode, Karin and Elizabeth, analyse Michael Jackson’s short film Who is It. The main question is: To what extent can ‘Who is It’ give us insight into Gender, Race & Sexuality other than the betrayal of a man by a woman? 1. Karin Merx, Elizabeth Amisu, Roberta Meek, and Lisha McDuff. “Episode 8 – MJAS Exclusive: Michael Jackson & Prince Part I (with Lisha Mcduff & Roberta Meek).” Podcast, Michael Jackson’s Dream Lives On: An Academic Conversation 2, no. 3 (2016). 2. Karin Merx, Elizabeth Amisu, Roberta Meek, and Lisha McDuff. “Episode 9 – MJAS Exclusive: Michael Jackson & Prince Part II (with Lisha Mcduff & Roberta Meek).” Podcast, Michael Jackson’s Dream Lives On: An Academic Conversation 2, no. 3 (2016). 6. E. Amisu, ‘A Critical Survey of Michael Jackson Studies’, The Dangerous Philosophies of Michael Jackson: His Music, His Persona, and His Artistic Afterlife (Praeger 2016) 9-18. 7. S. Fast, Dangerous (Bloomsbury, 2014) 110. 8. J. Vogel, ‘Dangerous, Nevermind and the Reinvention of Pop’, Featuring Michael Jackson: Collected Writings on The King Of Pop (Baldwin Books, 2012) 29-36. 9. J. Vogel, ‘Dangerous’, The Man and His Music: The Creative Life and Work of Michael Jackson (Sterling, 2011) 130-169. 10. 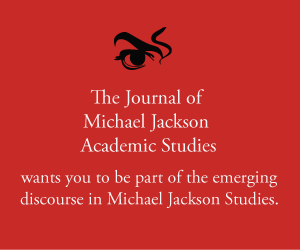 E. Amisu, ‘Identity and Identification in Michael Jackson’s Dangerous‘ The Dangerous Philosophies of Michael Jackson: His Music, His Persona, and His Artistic Afterlife (Preager 2016) 41-48. 11. I. Petitjean, Dangerous – From Mark Ryden to Michael Jackson: Pop Culture in the Pantheon of Fine Arts (Delatour, 2017). 12. M. Smallcombe, Making Michael: Inside the Career of Michael Jackson (Clink Street, 2016) 181, 182, 293. 13. J. Vogel, ‘Dangerous’, The Man and His Music: The Creative Life and Work of Michael Jackson (Sterling, 2011) 162. 14. M. Jackson, Dangerous (MJJ Productions inc., 1991) 14. 16. S. Fast, Dangerous (Bloomsbury, 2014) 111.